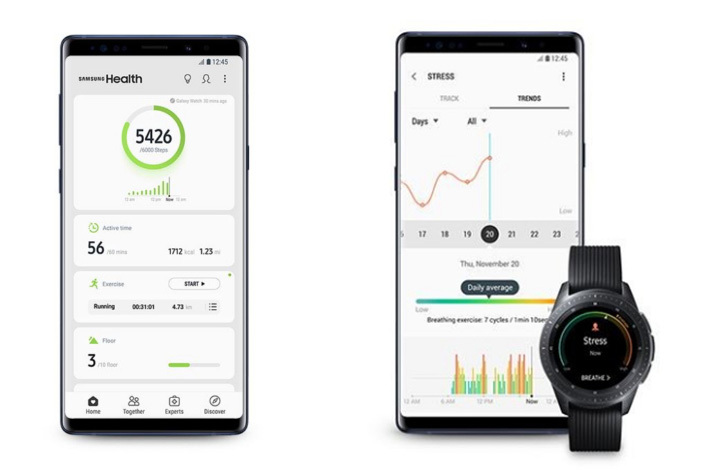 Samsung Health is the fitness tracking hub built into all Samsung phones, but you can install it on other Android devices, too. Maybe you'll want to do that now that the app has gotten a fresh coat of paint. Samsung is rolling out a big v6.0 update with a new UI and social features. Samsung's Play Store listing has been updated with the changelog, but it doesn't include much detail. Most of the traditional fitness tracking things are in the Home tab. Step counting is up at the top, but cards for active minutes, stress, exercise tracking, and more are all below that as you scroll down. If you have a Samsung wearable, much of this data is filled in automatically when the device syncs. There's also a new Discover tab with articles, fitness tips, and opportunities to buy one of the aforementioned Samsung wearables. The Together tab includes community challenges and comparisons of your stats with the Samsung Health community at large. Some users started seeing this update a week ago or more, but now Samsung Health 6.0 is live in the Play Store for everyone.